"This is a blended-coffee treat much like an iced cappuccino you might buy at a restaurant. You can make it non-dairy by using soy milk." Combine the instant coffee, milk, vanilla extract, sugar, ice, and chocolate syrup in a blender; blend until smooth. I used Splenda and it tasted great! 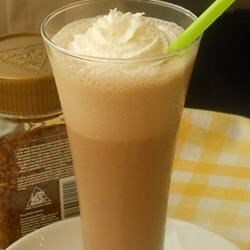 Loved this, I used skim milk, sugar free chocolate syrup, and french vanilla slenda since I am watching my calories. I also added some instant french vanilla cappucino.